Great minds think alike. No sooner had I finished writing Friday's bio on Dirk Davis than I clicked over to Ross Pearsall's delightful Super-Team Family Presents... blog and found that he's also got Booster Gold's agent on his creative mind. 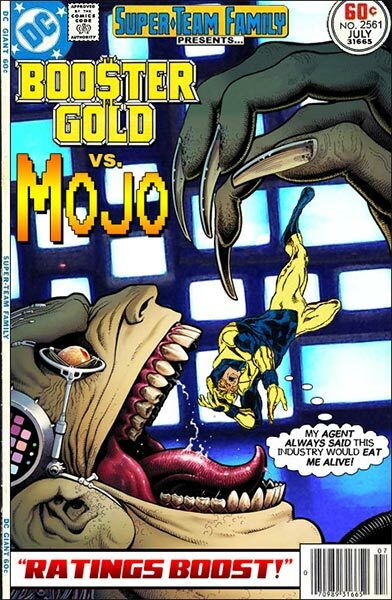 Mojo is an X-Men villain from another universe who, like Booster Gold, debuted in the mid-1980s as a commentary on American celebrity culture. In Mojo's case, he's a parody of a television network executive whose only desire is to get great ratings at any cost. In other words, he's a natural foe for popularity-obsessed a Booster Gold! 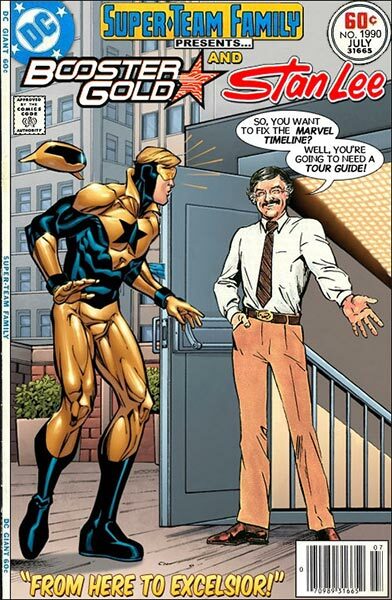 If Booster Gold gave six news interviews and then gave eight more, how many interviews has he given in all? If there were nine villains, and Booster Gold defeated five of them, how many villains remain? I have sung the praises of Ross Pearsall's Super-Team Family Presents... covers for years. And I'll keep doing it so long as Ross continues to create such masterpieces as this, the latest to feature RoboFoce, Skeets' all-robot action team! Issue #2450 was the sixth RoboForce cover appearance. Since I have only shown 3 of them, I'll correct that oversight now by adding the two I missed. I particularly love that all of these feature a different Skeets model. Click on any of these covers to visit BraveAndBoldLost.blogspot.com and see more of Pearsall's imagination at work. What's your opinion of the theory Skeets is behind the Sanctuary murders? I was planning on addressing that tomorrow, but my short answer is I doubt it. If you owned seven Booster Gold comics and then bought eight more, how many total comics do you have? If a villain held ten hostages and Booster Gold freed five of them, how many hostages remain? I first re-published the following image from Ross Pearsall's incomparable Super-Team Family Presents... blog back in 2017, but it's even more appropriate today. Lee has oft been accused of seeking the limelight at the expense of others, a personality flaw that should be painfully familiar to Booster Gold fans. 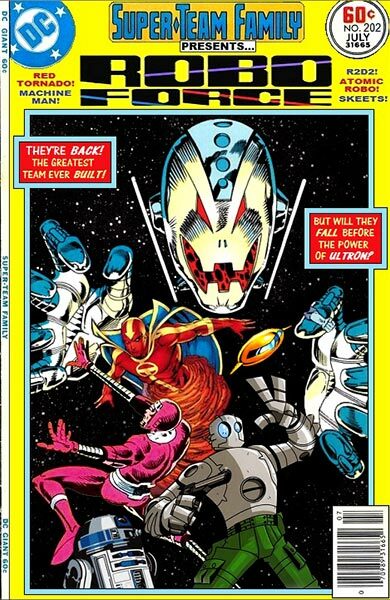 Whatever faults he might have had, Lee was a master storyteller and promoter, and I shudder to think of what American superhero comics might now be if not for his contributions to the medium. Thanks, Stan. If you owned three Booster Gold comics and then bought six more, how many total comics do you have? If you had three dollars and then spent two dollars on Booster Gold comics, how many dollars do you have left? 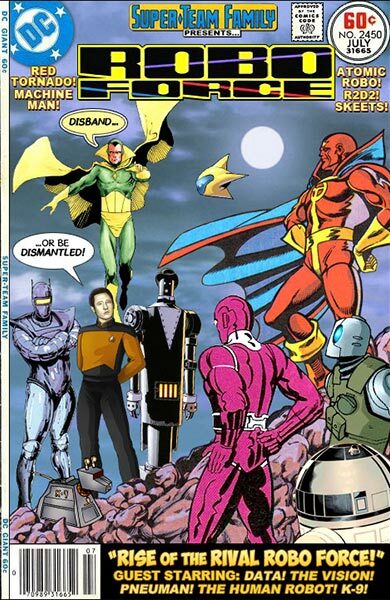 I've made no secret of my appreciation of Ross Pearsall's Super-Team Family Presents... mash-ups. They're all great. The latest to feature Booster Gold is no exception. If I saw that cover on a newsstand, it would definitely be coming home with me. Great work, Ross. If Booster Gold gave two news interviews and then gave two more, how many interviews has he given in all? If you had four dollars and then spent three dollars on Booster Gold comics, how many dollars do you have left? 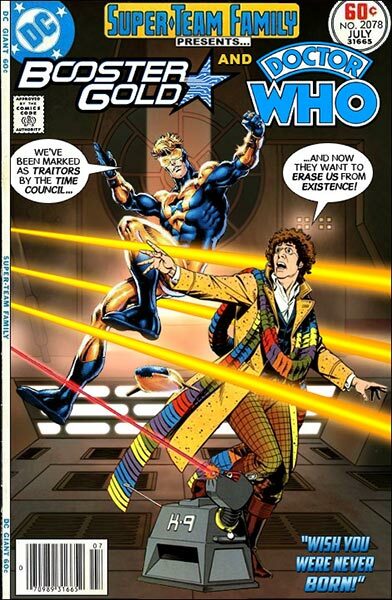 Newsarama.com recently declared Booster Gold the best time-traveling comic book hero "of all time." (Does that include the comic books of the future?) 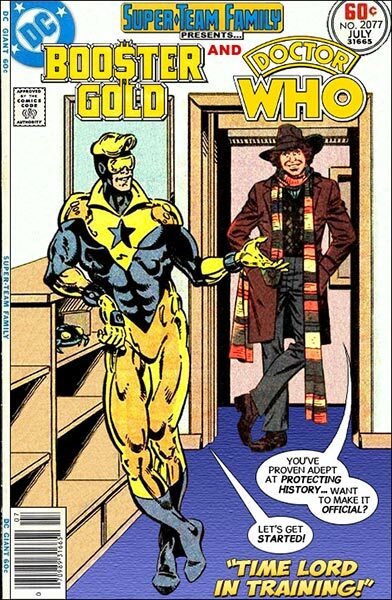 However, Booster still isn't as well known as television's greatest time traveler, Doctor Who. Ross Pearsall has done his part to correct that imbalance in two recent issues of his long-running Super-Team Family Presents... mash-ups. And these aren't the only Booster Gold related team-ups Pearsall has given us in the past month. 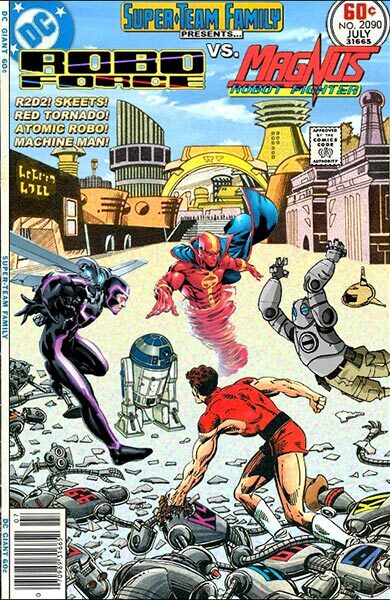 Ross also reunited Roboforce, the all-robot team of Skeets, R2D2, Red Tornado, Atomic Robo, and Machine Man in a battle against their mortal enemy, Magnus: Robot Fighter! You can see that issue on braveandboldlost.blogspot.com. Keep up the good work, Ross. If you owned three Booster Gold comics and then bought nine more, how many total comics do you have? 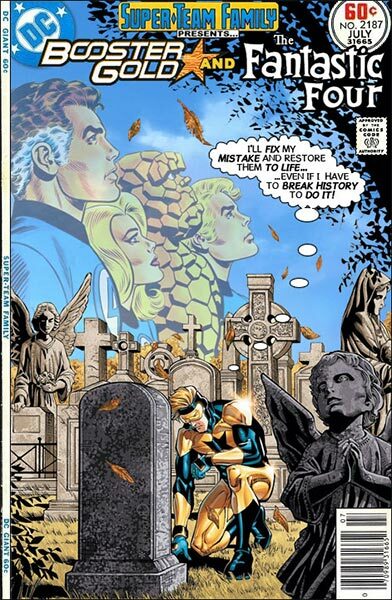 If Booster Gold had six costumes and Doomsday destroyed five of them, how many costumes remain?